The arrangement of the psychic body is reproduced in the physical with the spinal column as a rod and the ganglionic centres as the chakras which rise up from the bottom of the column, where the lowest is attached, to the brain and find their summit in the brahmarandhra at the top of the skull. 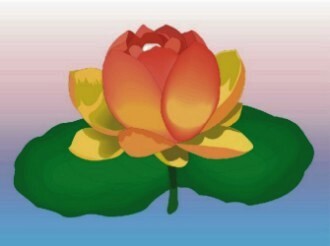 These chakras or lotuses, however, are in physical man closed or only partly open, with the consequence that only such powers and only so much of them are active in him as are sufficient for his ordinary physical life, and so much mind and soul only is at play as will accord with its need. This is the real reason, looked at from the mechanical point of view, why the embodied soul seems so dependent on the bodily and nervous life,--though the dependence is neither so complete nor so real as it seems. The whole energy of the soul is not at play in the physical body and life, the secret powers of mind are not awake in it, the bodily and nervous energies predominate. But all the while the supreme energy is there asleep; it is said to be coiled up and slumbering like a snake,--therefore it is called the kundalini shakti,--in the lowest of the chakras, in the muladhara.